Hello! I think you'll find this month's song a little closer to the "this is just loops" end of the spectrum. 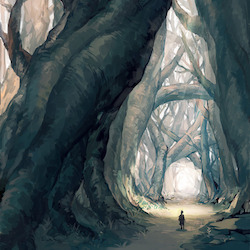 I've made a few songs this month in this style for a new project, and I wanted them to feel like a original soundtrack to the story they accompany. This is a concept track like pretty much all I do anymore. In this case, a woman is seeking out a militia that has gotten lost in a rather hostile wilderness. She and her little fairy thing are headed to Militia Nine's location now that they've spotted them. This is a world where you have a sort of "broken technology" vibe, and I really liked trying to use the sort of narrow, lo-fi piano with the guitar and ambient stuff to give the track some width. The time signature is 3/4 in this one, which was a breath of fresh air after so many 4/4 that I've done. I think the drums might be a little strong in the mix, so perhaps I'll revisit it in the future. the 'broken' technology vibe really works well. Portrayed with the randomesque melody. This so reminds me of the computer game ..... Civilisation. I think you just gone invented a new 'broken' Civilisation....Maybe the Last Singers?? The percussion track rolling over and over really suits itself to long chunks of contemplative gameplay. As for selling, my plan is to polish this and the rest just a little more (I'm not a mastering genius, but I'll do what I can) and release them together with a book I'm writing. I made the songs as a brainstorming exercise these last 30 days, and I found it extremely satisfying. I started writing the actual book a little more than a week ago and it's coming along nicely. I want to talk to some people about releasing related media and such for books sold to publishers so that I can approach it correctly. In the end, it'll be a while before anything happens, long enough that I could be sick of the songs by then! Your reaction to this one is greatly encouraging and I'm glad I got to share it! It was immediately one of my favorite tracks for the batch and came out great right from the start. Glad you are continuing with electronic music, this in my opinion is your creative tool. Actually I like the volume of the drums, however where there is little going on in the track you may want to experiment in either muting the drums completely or just have a few light percussive strokes, this will expand the dynamics. You could also try adding more reverb of some of the instruments, think this will suite the mood better. Anyway overall it's a nice creative piece of music, interesting. You're right about dynamics. That'll probably resolve what it was I felt about their relentless sound. I went light on reverb on the initial mix, and though I turned it up for this mix, I think I got too comfortable with the dry sound to have thought of turning it up again. The whole intro bit has the reverb send for the drums completely down and only goes up once the rest of the voices start. It might be too subtle a change. I tend to forget there's any reverb on the drums at all until the quieter middle comes back. I'll have to play with it soon and see! This just pulled me right in. It felt like it was alive you know? Like it was aware of its own presence and had something to say. I love how it sounded. Personally I think the relentlessness of the drums adds to what feels to me like a hidden aggression that isn't realized on the surface. Super well done!! Loved it. Trippy. My droid is digging it. He is doimg the stanky leg to it as we speak. Silly little robot. Would love to have a small vocal, almost spoken word, nothing crazy, just one small phrase repeated at certain poimts throughout. I can hear it in my head, but cant make out the words.